Here, Chef Sean shows us how to make one of two types of nigiri sushi. 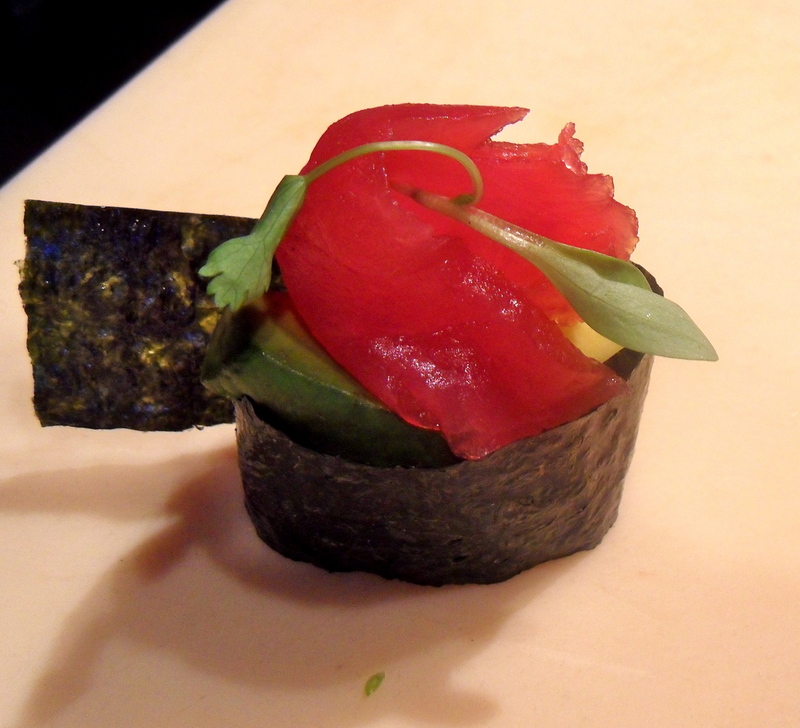 Nigiri is when you take sushi rice, ball it up, and place something (like raw fish) on top of it. This particular type of nigiri is called gunkan sushi– Japanese translation: battleship- because of its shape. Gunkan sushi is good for ordering tobiko (flying fish roe), ikura (salmon roe) and uni (sea urchin). The batle ship shape works as a little cup to hold everything in one place. It really is quite easy to make– I made the one pictured here– avocado and mango topped with big eye tuna. All you have to do is find some nori (toasted seaweed) and have at it. You can add all kinds of seafood, fruit, veggies, what ever you like.